1.0 out of 5 starsA story of abuse and trauma/Empaths Beware! At first I was interested by the idea of seeing the world through the perspective of someone on the Autism Spectrum, but then it becomes apparent that this is a human in excruciating psychological pain. How anyone could actually read this and refer to it as funny is beyond me. As the picture of the abuse and trauma that Eleanor suffered at the hands of a mentally ill mother unfolded, I felt emotionally assaulted by the author. Finally, we are supposed to believe that a few therapy sessions and a nice man will quickly undo all the damage and Eleanor will be healed, instantly stop drinking, and start living like a 'normal' person. 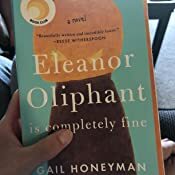 Eleanor Oliphant is one of the most interesting characters that I have read in a while. She is blunt. Very blunt. She lacks social skills and tends to spout off facts to people just having conversations. She likes her routine. Every Friday, stop and buy pizza and vodka. And every Wednesday, she talks to her mother. Those are never very good for Eleanor. Her mother is mean and angry and leaves her feeling less than. Something happened to Eleanor when she was a child. Something that left her with a scar on her face and moving from foster home to foster home. Does she remember it all or is it her coping mechanism? Things start to change in her life when her company’s IT guy, Raymond, and Eleanor help an old man who has passed out in the street. Family is the one thing that she has been missing. There is so much to Eleanor. In the beginning, I thought that I didn’t care too much for her but as time went on and she opened up, well, I fell in love with her. I would venture to say that she is on the autism spectrum. What a sad story she had lived and what a wonderful world opening up for her. Beautifully written and just a lovely story, you will fall in love with Eleanor too. So this book sweeps you right into quirky but sad Eleanor's life and for me, I was glad of it. 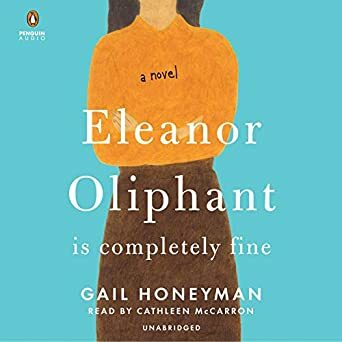 I loved the way the book has just the right amount of detail and let's Eleanor's ways reveal moments of humor, sadness, strength, and vulnerability. I laughed and cried and cherished the journey with her to the end. 5.0 out of 5 stars5 STARS!!!!!!! I wish there were words for how much I loved this contemporary fiction/ chick-lit / Brit-lit novel. Eleanor Oliphant is the definition of 'socially awkward.' Think Sheldon from Big Bang Theory minus his little band of nerds and giant ego. Awkward!!! She is never sure if people are being sarcastic or serious. She gives a lot of unsolicited advice, thinking she is being helpful when she's really being obnoxious, then she mentally (and occasionally orally) notes what she perceives as others poor manners or stupidity in said person. She's hilarious without meaning to be. From the very beginning, the reader knows that things are not 100% right for Eleanor. She has serious "Mummy Issues" (love the British Speak, mummy issues sound so much more sophisticated than mommy issues! ), her coworkers blatantly make fun of her, she has no friends, she relies on vodka to get her through the weekend and has these mysterious scars on her face which are significant enough to cause people to stare. On a very rare night out, she goes to a concert and completely falls for one of the musicians without even so much as exchanging a single word with him. Eleanor begins a journey of physical self improvement in order to prep herself to meet this musician. Her journey includes a hilarious visit to a waxing salon, a couple extremely uncomfortable "practice" social outings and a few lol worthy shopping trips. In addition to the outward improvements, Eleanor decides to open herself to new experiences so she will be ready when she meets her musician in person. Her newfound openness comes in handy when, after years of loneliness, she accidentally stumbles into two new unlikely friendships. 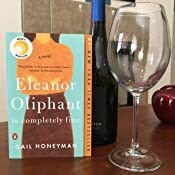 Although there are many truly amusing parts in this story, it also has a very serious side, particularly when the reader learns of Eleanor's past and the origins of her scars. 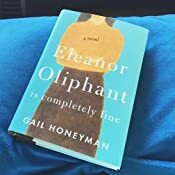 Author, Gail Honeyman, slowly doles out the details of Eleanor's heartbreaking backstory leaving the reader 100% on Team Eleanor. I, for one, was cheering her on and celebrating her growth as though she were my real life friend. The whole thing with Bobbie Brown makeup. She was soooooo clueless that she had no idea who Bobbie Brown is and at one point she 'questioned Ms Brown's work ethic' since Bobbie never seemed to be at her makeup counter. 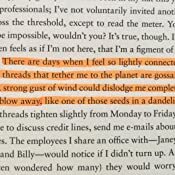 I LOVED Eleanor's observations on other people and how she often missed the point so significantly and then she thought everyone but her was crazy. Super entertaining. I loved how Eleanor just spoke her mind without concern for social convention. That was funny enough, but reading others reactions to her comment was the icing on the cake. Some people laughed and found her refreshing, others thought she was crazy or rude. The story itself was just so darn good!!! In my opinion, a good book in this genre is one which makes the reader laugh, think deeply, feel significant empathy for the characters and stays with the reader long after completing the story. For me, this book did that, and more. I was so sad to see it end. I miss her already. This book got my 5 star rating which means that if there was something I didn't love about the book, the good outweighed the bad so heavily that I forgot anything I didn't like.